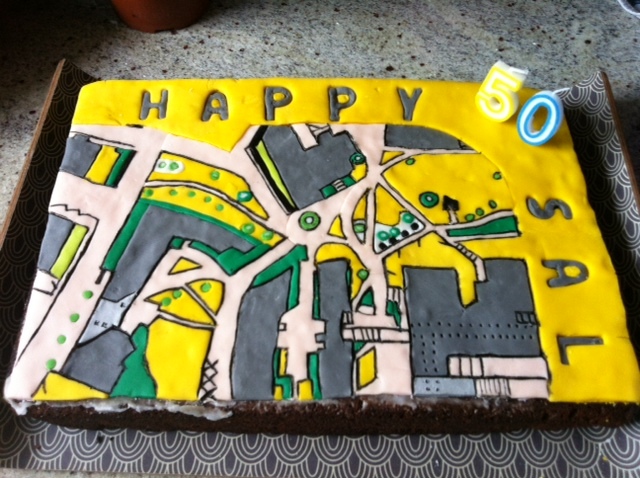 I’ve always liked the psychedelic colours of urban orienteering maps, so I decided to put one on my 50th cake. I chose Leeds Uni as the JK Sprint will be taking place there on Good Friday 2016 and our daughter will be starting there that autumn. 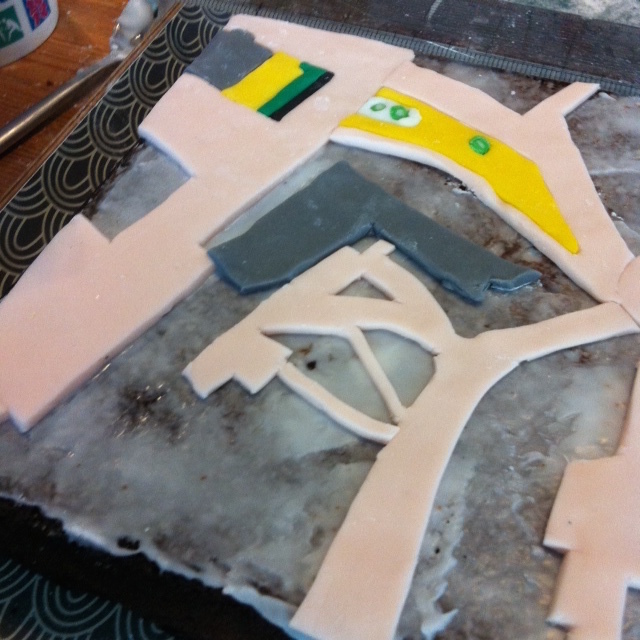 When I put ‘urban orienteering cake’ into Google images, nothing relevant came up, so I figured it was worth sharing! 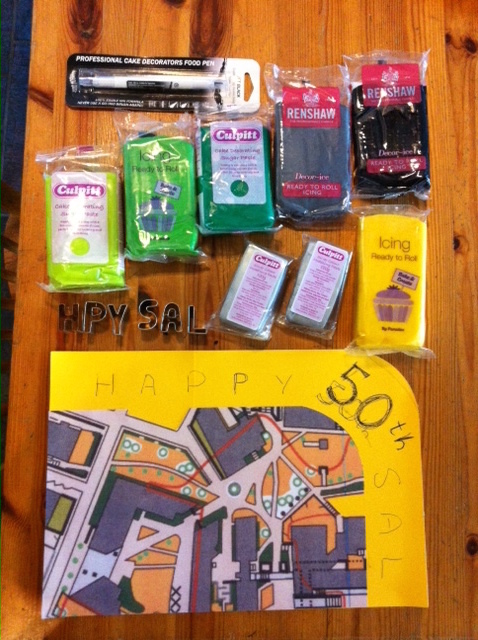 Ultra blog turned bake-off … ssshh, don’t tell the Exercise Police! I enlarged an extract of the map to 200% to size to a suitable cake tin. With hindsight 300% would be better as the tiny detail takes ages to make in icing! I doubled the quantity of my dairy-free chocolate mayonnaise cake and turned it upside-down so the icing was on the base and therefore nice and even. Road lattice and part of Charles Morris (Charlie Mo) Hall. I repeat: the glacé icing layer underneath the ready-roll was a mistake! Help then arrived in the form of Al as the hours needed for this project were considerable! 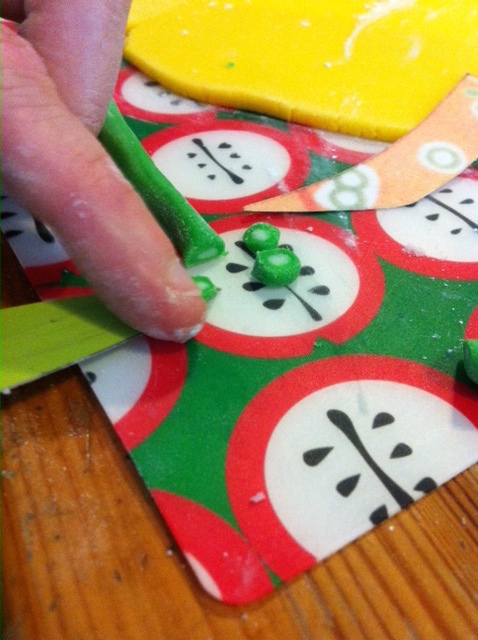 She scalpelled the road network out of the photocopy so we had a template to cut the icing from. But when we tried to manoeuvre this large lattice of icing onto the cake, disaster struck as we’d made the mistake of putting a thin, wet layer of glacé icing on first. DO NOT DO THIS. We started again, cutting the lattice into three parts and putting on the cake dry so we could move it to fit the inner bits of the ‘blocks’. Stress over, filling in the blocks was much more straightforward … fun, even! Circular detail can be cut out with the end of a drinking-straw, e.g. trees on yellow ‘open land’. 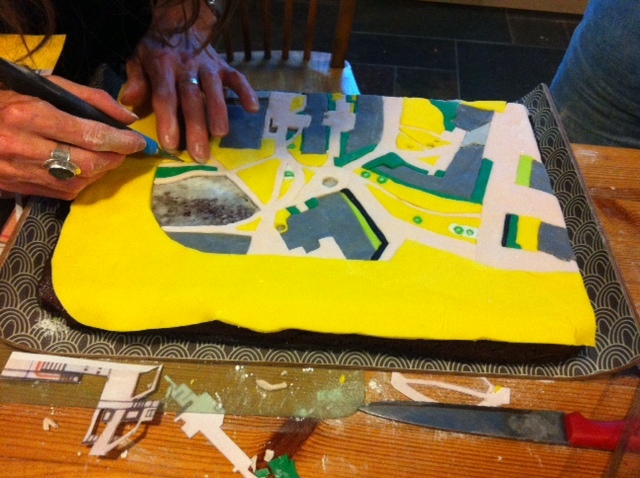 We decided to counter-sink everything as I wanted a flat finish, like a map, so we cut out the green tree circles, cut holes in the yellow grass and sunk the trees into them. We were delighted with the finished result. The icing alone took 11 hours between 4 of us, so I’d definitely simplify this if I ever tackle it again. Also, I should have got a closer match on the orange ‘open land’ instead of the yellow. I used a set of alphabet cutters for the lettering, again counter-sunk into the base layer. 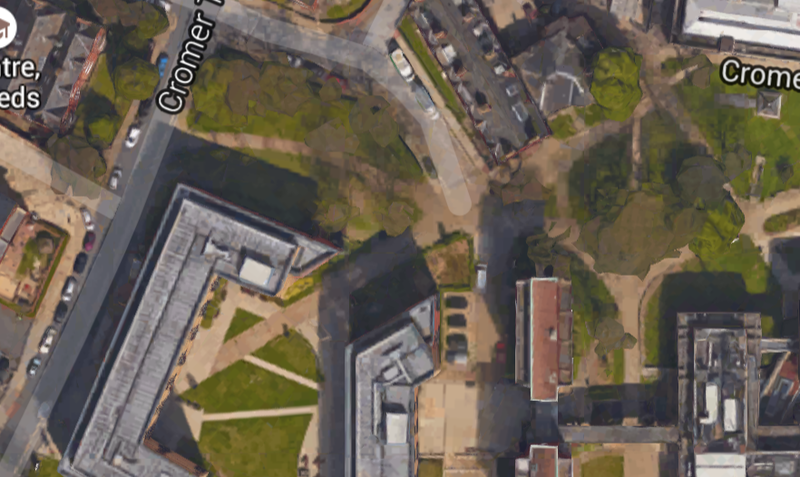 The cake was a definite talking point amongst us Leeds graduates but (I’m ashamed to say) we had to use Google Earth to identify which bit of the campus it was!! The black lines for steps and man-made objects finished it off nicely, thanks to Sarah for that!